Discover the basic mechanics of iSCSI storage technology and how typical iSCSI standards and components operate, including targets, initiators and LUNs. administrators reluctant to even consider an implementation of an iSCSI-based SAN is that they are concerned that they are implementing a proprietary system. These fears are unfounded. Basic SCSI (or Small Computer Systems Interface, but pronounced skuzzy) was developed by Larry Boucher who later founded Adaptec; SCSI was first widely adopted in the desktop world by Apple. Originally, SCSI defined a 50-pin parallel interface for connecting computers, disks, tapes, scanners, optical media, and other devices at a maximum speed of a whopping 10MBps. SCSI has been widely adopted over the years on many platforms. The standard has been expanded so that the current SCSI-3 protocol can be used over other media such as Fibre Channel connections, FireWire connections (using the Serial Bus Protocol), and IP networks. iSCSI (pronounced eye-scuzzy) is an implementation of the SCSI protocol that transports SCSI communication and data over IP networks; it is an official Internet standard adopted by the Internet Engineering Task Force (IETF) in RFCs 3720 and 3783. Though this standard was ratified in 2003, it was not immediately adopted for widespread use. However, Gigabit Ethernet has become increasingly common and affordable and thus has encouraged acceptance of iSCSI. The typical iSCSI environment is illustrated in Figure 3.1. In any iSCSI environment, you have targets and initiators. The initiator is the client and the target is the host that is providing the LUN; typically, the target LUN is disk storage, but in practical terms, it could be a tape device, optical disk, or other device on the target system. Figure 3.1: Initiator and target illustrated. In some cases, the initiator is software that is installed on the client operating system (OS) such as the Microsoft iSCSI Software Initiator. However, the initiator may be combination of hardware and software; in this case, the hardware may be a dedicated iSCSI adapter that provides boot and TCP offload processing capabilities as well as the device drivers and software to manage the iSCSI adapter. Hardware-based iSCSI adapters can provide higher levels of performance than a software-only solution because a hardware iSCSI adapter can offload much of the processing related to network communication to the memory and processor on the hardware adapter. You are reading tip #1 from "iSCSI SAN storage for Microsoft Exchange – 5 tips in 5 minutes," excerpted from Chapter 3 of the book "The Shortcut Guide to Exchange Server 2007 Storage Systems," by Jim McBee, copyright 2007, published by Realtimepublishers. 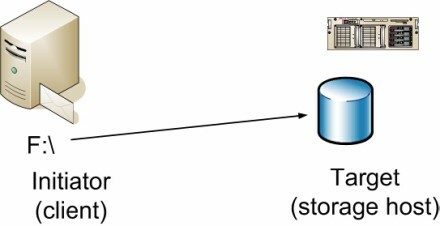 The target system is any type of networked storage or SAN that supports the iSCSI protocol and allows the target's local resources (usually disk volumes) to be assigned to a LUN that can be accessed through the iSCSI protocol. The LUN represents dedicated storage that has been allocated or carved out of the available disk storage on the target system; the LUN will not be in use by more than one initiator at a time. In simple storage configuration, the LUN will be assigned to only a single initiator; however, the exception to this is in the case of clustered nodes. Each node of the cluster must be able to access a LUN on which data may reside and that the cluster must access. NOTE: Once connected to a remote LUN, the LUN appears to be locally attached storage on the target to applications such as Exchange Server, SQL Server, or even file sharing. This initiator/target architecture that uses a combination of well-defined and widely used architectures (SCSI-3 and TCP/IP) allows many organizations that would not have been able to use networked storage otherwise to take advantage of it. Part of this is due to cost and part is due to expertise. Managing a large-scale SAN system requires quite a bit of additional expertise and the Fibre Channel infrastructure for connectivity to the SAN is costly for small and midsized businesses. iSCSI simplifies the connectivity and has allowed storage vendors to provide simpler solutions for not only larger businesses but also small and midsized businesses. iSCSI allows organizations to leverage their existing knowledge (and possibly infrastructure) when deploying the IP network infrastructure necessary. In addition, iSCSI can provide a higher level of data transport security than Fibre Channel if both the initiator and target systems support the IPSec protocol. Using IPSec, connections between the initiator and the target can be both authenticated and/or encrypted. Redundancy in connectivity between the iSCSI target and the initiators can be achieved simply and cost effectively with additional networks. Provided both the initiator and the target support multi-path I/O, the initiator can then use multiple networks to connect to the target. This, of course, requires that both the initiator and target systems have multiple network adapters.